• Can the Alternatives Pick Up the Slack? SweetHearts have gone missing. They are the most popular brand of the most popular Valentine's Day candy, and they're not on shelves this year. As a result, conversation hearts' reign as the top Valentine's Day candy will end this year - with sales falling by an estimated 80%. Conversation hearts candies are the little hearts with cute sayings on them: Be Mine, Marry Me. They are the most popular candy for Valentine’s Day season – which is estimated to generate over $1.8 Billion in candy sales. If the biggest brand vanished, would conversation hearts still be the most popular candy? Not even close. It’s not really possible to lose 80% and keep the throne. 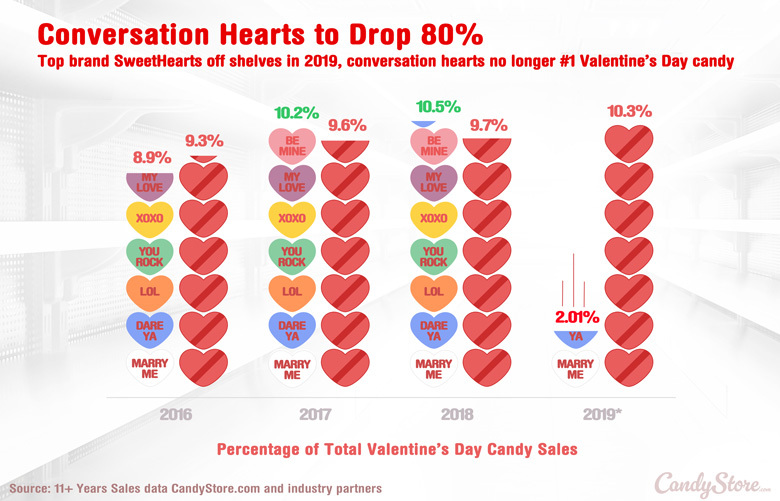 So where does that leave overall conversation hearts sales this year. Down big time, we estimate. Last year, we reported that, based on the number of pounds sold, conversation hearts were the new #1 Valentine’s candy in America. Heart shaped boxes of chocolates had been overtaken after a slow and steady rise of the little sugar hearts with cute sayings on them. Now that we have the full 2018 data, we can report that that trend increased slightly last year. As you can see in the chart above, we believe that trend will end sharply in 2019. An 80% drop off in a sales category that is over 23 million pounds seems like a lot of wasted profit potential. Why would anyone allow those sales to slip away, you ask? Last year, Necco announced they needed to sell the company, and the fate of SweetHearts – as well as their other brands – was thrown into limbo. Would someone buy Necco, or buy the individual brands, or would Necco and SweetHearts just die? On July 24, 2018 the factory was shut down. Factory workers were told not to show up to work the next day. To give you an idea of why that matters to this year’s crop, here are a few numbers. 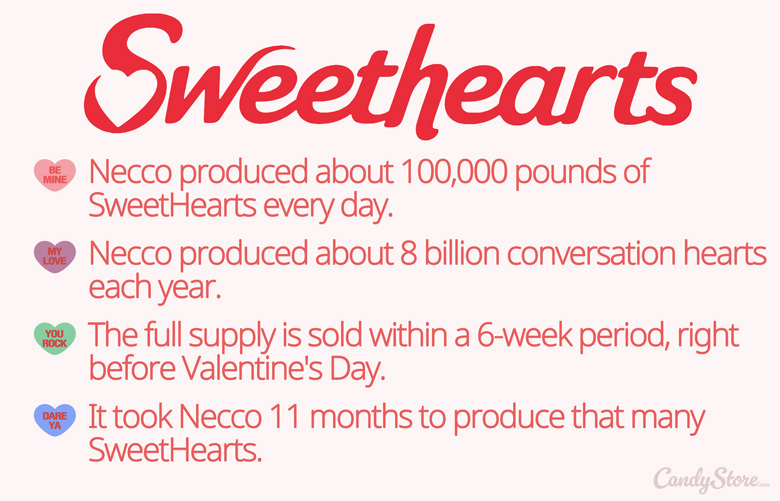 As you can see, unless the Necco factory was allowed to keep rolling, it was going to be tough to produce enough SweetHearts to meet demand come January. And if a new company was going to try and ramp up that kind of production that fast, it would be very difficult or very expensive. In the end, Necco was bought in an auction by Round Hill Investments. They turned around and sold the SweetHearts brand to Spangler Candy Company in late September 2018. While all that time ticked away it became less and less likely that SweetHearts would be available for 2019. So you’ll have to find another way to share sweet noncommittal innuendo this year. But only this year. *EDIT: Any SweetHearts products you find online this year are leftover from previous years. You may or may not be ok with that. Here’s an article about candy expiration dates. *UPDATE 1/24/19: Spangler has removed a press release from their website that that was the source of the above quote from CEO Kirk Vashaw stating SweetHearts would return in 2020. CandyStore.com has not been able to verify whether that means SweetHearts could possibly not be back for the 2020 Valentine’s season or if there was some other reason to pull the release from their site. We do know that production on SweetHearts has not yet begun as of today, January 24, 2019. We also acknowledge that manufacturing is hard and takes time to get right. As of now, we remain optimistic that Sweethearts will be ready for 2020. If Spangler were to need more time to get SweetHearts right, that would be understandable and ok with us too. We are still awaiting comment from Spangler on the likelihood that SweetHearts will return for 2020.